This blog describes how a script can be used to automate Open vSwitch PVP testing. The goal for this PVP script was to have a quick (and dirty) way to verify the performance (change) of an Open vSwitch (DPDK) setup. This script either works with a Xena Networks traffic generator or the T-Rex Realistic Traffic Generator. 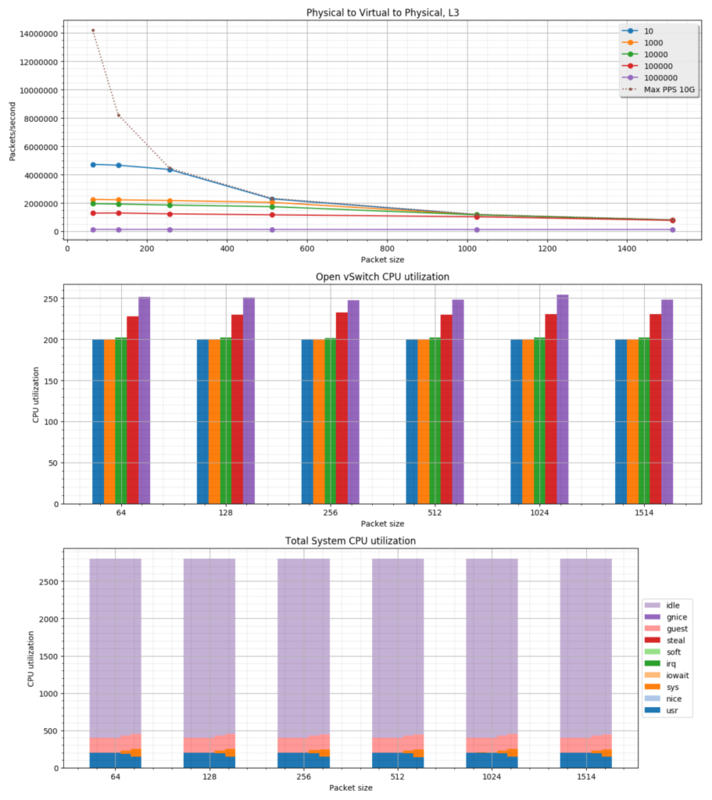 For details on what the PVP test does, please refer to the following blog post, Measuring and comparing Open vSwitch performance. This setup tutorial needs two machines with Red Hat Enterprise Linux, in this example, we use version 7.3. One machine will be used as a traffic generator using T-Rex; the other one will be the DUT running Open vSwitch. We use two Intel 82599ES 10G adapters to interconnect the machines. One of the two machines we will use for the T-Rex traffic generator. We will also use this machine to run the actual PVP script, so some additional setup steps are related to this. Please check out the T-Rex Installation Manual for the minimal system requirements to run T-Rex. For example having a Haswell or newer CPU. Also, do not forget to enable VT-d in the BIOS. In our case, we will use em1, so PCI 0000:01:00.0. However as T-Rex likes port pairs, we will also assign em2, 0000:01:00.1, to T-Rex. NOTE: Make sure your network card has a kernel driver loaded, i.e. has a Device name in the output above, or else configuration in the step below might fail. Stateful will use order of interfaces: Client1 Server1 Client2 Server2 etc. for flows. Stateless can be in any order. For interface 0, assuming loopback to it's dual interface 1. Destination MAC is 24:6e:96:3c:4b:c2. Change it to MAC of DUT? (y/N). For interface 1, assuming loopback to it's dual interface 0. Destination MAC is 24:6e:96:3c:4b:c0. Change it to MAC of DUT? (y/N). As our T-Rex machine has enough resources to also run the PVP script, we decided to run it there. However, in theory, you can run the PVP script on a third machine or even the DUT. But make sure to keep the machine close to the traffic generator (either the T-Rex or Xena), as it needs to communicate with it to capture statistics. For this tutorial, we use Open vSwitch in combination with the DPDK, userspace datapath. At the end of this document, we also explain how to redo the configuration to use the Linux kernel datapath. We need “Red Hat Enterprise Linux Fast Datapath 7” for Open vSwitch, and “Red Hat Virtualization 4” for Qemu. If you do not have access to these repositories, please contact your Red Hat representative. Our system is a single NUMA node using Hyper-Threading and we would like to use the first Hyper-Threading pair for system usage. The remaining threads we would like dedicate to Qemu and Open vSwitch. NOTE: If you have a multi-NUMA system the cores you assign to both Open vSwitch and Qemu need to be one same NUMA node as the network card. For some more background, information on this see the OVS-DPDK Parameters: Dealing with multi-NUMA blog post. # lscpu |grep -E "^CPU\(s\)|On-line|Thread\(s\) per core"
If you have a multi-NUMA system and you are not on NUMA node 0, you need to change the nodeset values above accordingly. Finally, get the IP address assigned to this VM, as we need it later when executing the PVP script. Now we are all set to run the PVP script. We move back to the T-Rex host as we use this to execute the script. - Done running performance tests! 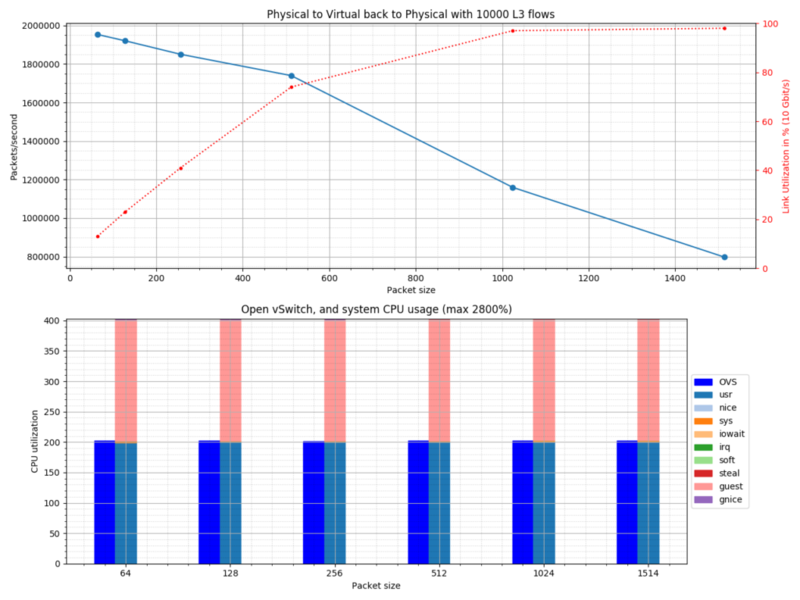 "Physical port, ""dpdk0"", speed 10 Gbit/s"
"Physical to Virtual to Physical test, L3 flows"
For every flow size a separate graph is created, test_p2v2p_xxx_l3.png, in addition to two overall graphs. The test_p2v2p_all_l3_ref.png will show all flow sizes in one graph with the addition of the theoretical maximum, the test_p2v2p_all_l3.png does not show the theoretical maximum. Below you will find the content of the test_p2v2p_10000_l3.png and test_p2v2p_all_l3_ref.png as an example.